Before you can fix a flow, you must identify why it failed. Click or tap the notifications icon at the top of the web portal (or open the Activity tab in the mobile app), and then click or tap your flow in the list that appears. Details about the flow appear, and at least one step shows a red exclamation icon. Open that step, and review the error message. At the top of the web portal, click or tap the gear icon to open the Settings menu, and then click or tap Connections. Scroll to the connection for which you saw the Unauthorized error message. Next to the connection, click or tap the Verify password link in the message about the connection not being authenticated. 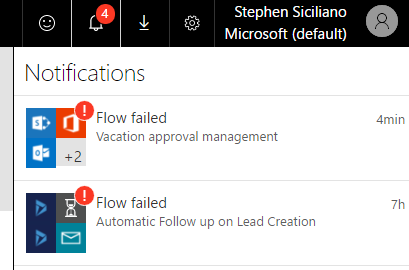 Verify your credentials by following the instructions that appear, return to your flow-run failure, and then click or tap Resubmit. The flow should now run as expected. Flows also fail if a setting in an action of the flow doesn't function as expected. In this case, the error message contains Bad request or Not found, or an error code of 400 or 404 appears. The error message should specify how to correct the failure. You'll need to click or tap the Edit button and then correct the problem inside the flow definition. 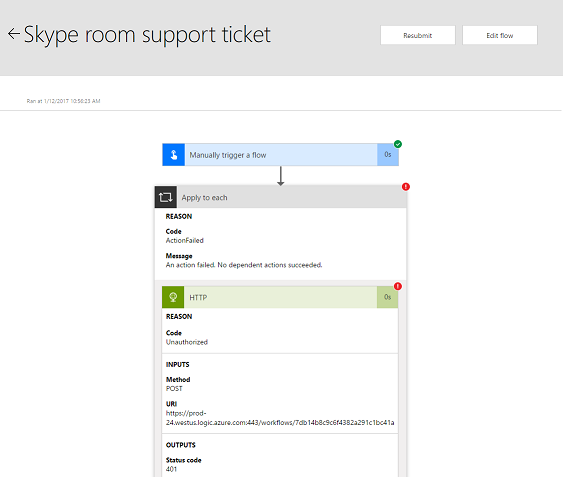 Save the updated flow, and then click or tap Resubmit to try the run again with the updated configuration. If the error code 500 or 502 appears, the failure is temporary or transient. Click or tap Resubmit to try the flow again. If you encounter some other problem, please ask our community because others may have encountered a similar problem.